Change a bathroom drawer in a matter of minutes with the simple use of a few drawer organizers. Here you can see the many items in this one small drawer. There is no real organization and things tend to shift around on their own. There are lots of toothbrushes, floss and travel sized items. I went over to Target and got a few drawer organizers to use in my bathroom drawers. First, I went through each drawer and decluttered anything that didn’t belong in the bathroom, or it was old and expired, or was simply meant for the trash. Then I wiped down the drawers to get a fresh start. 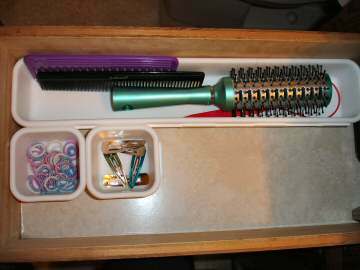 A long cutlery organizer works great to organize combs and brushes in a small drawer. These small square containers are great for holding those small items like pony tail holders and barrettes. 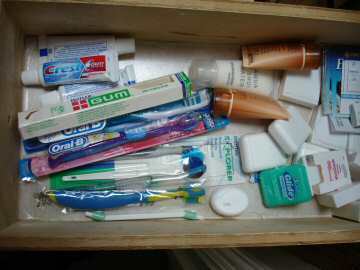 In the other drawer, I had a large supply of toothbrushes and floss. I was able to put them all into a long cutlery organizer. 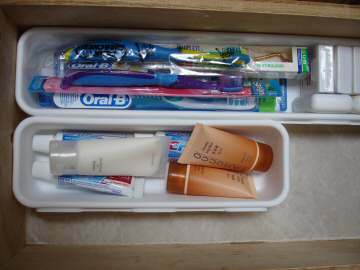 The medium sized tray was perfect for all the extra travel sized toothpastes I had. Now both of the drawers look almost empty! There is lots of room for additional items and more organizers if needed. This drawer make over only took me a few short minutes. Hopefully this helps show you that you can make a huge difference in a very short amount of time with just a little decluttering and a few organizing items. This simple decluttering project can be done in any drawer in your home... in the kitchen, a bedside table, desks, etc. Short little projects like this add up to big changes over time. Go ahead and tackle a few easy projects and see if it gets you inspired!